Set between the lovely cities of Carnarvon and Geraldton in Western Australia, the coastal town of Kalbarri is, without a doubt, best known for the stunning national park set right on its doorstep. Split into 2 main sections – 1 coastal and 1 inland – this is a diverse national park that really showcases the best of the beautiful scenery in this part of the world and makes the perfect stopover on any west coast road trip. 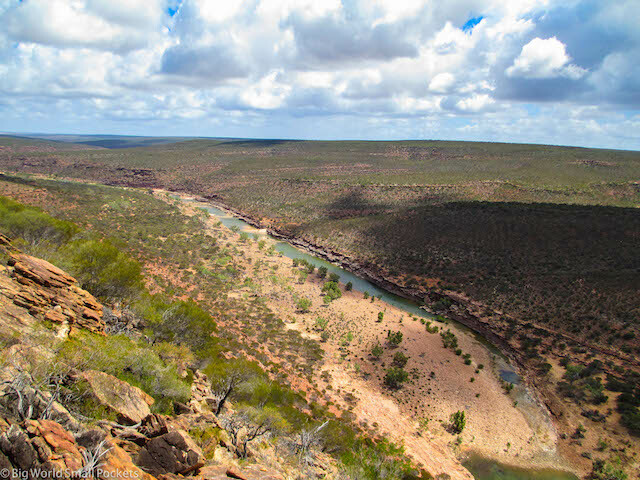 Over 180,000 hectares in size, Kalbarri National Park is dominated by a 400 million year old landscape that has cut into beautiful red and white banded gorges by the Murchison River. 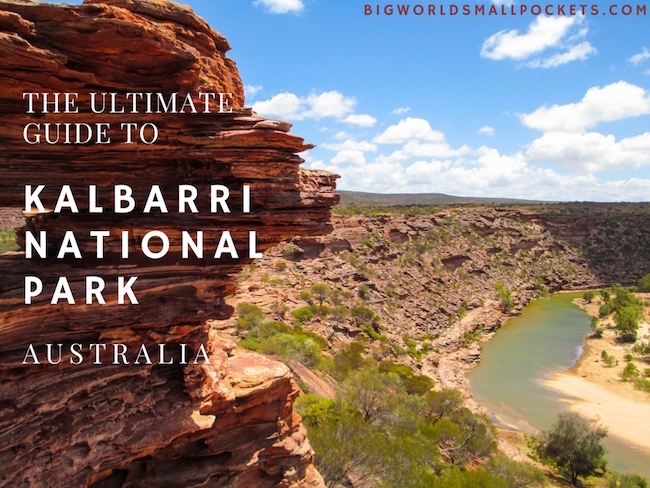 Bringing you all the inside knowledge following our time there, here is my ultimate guide to Kalbarri National Park. 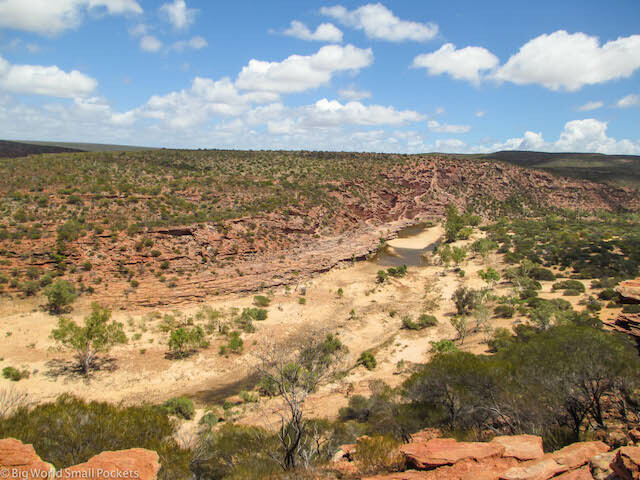 Why Should You Visit Kalbarri National Park? 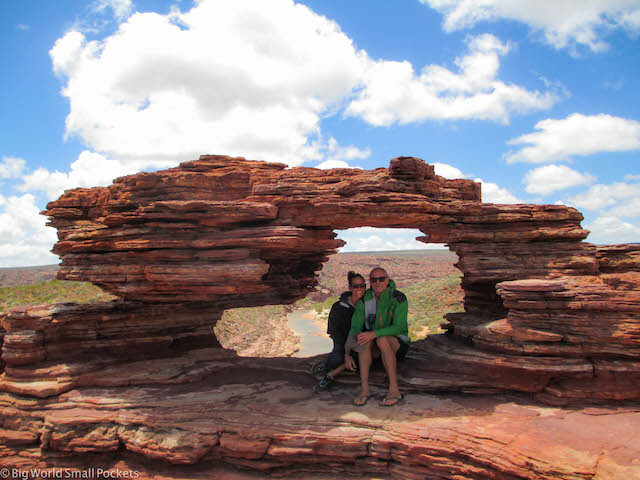 Kalbarri National Park is one of the most accessible of Australia’s top rated national parks. With sealed roads throughout most of the park, it is ideal for families or those without 4wd and can easily be visited as part of a longer road trip up the West Coast. But don’t for a second think that Kalbarri is any less beautiful because it’s easy to get to. From deep gorges to delightful lookouts, stunning photo opps and some of the best wildflower displays in the state, this National Park packs a mean old punch when it comes to showing off the wild and wonderful landscape of Western Australia at its best. The nearby town of Kalbarri itself is also a great destination. Encompassing both a river and the ocean it’s a watersport and fishing mecca! 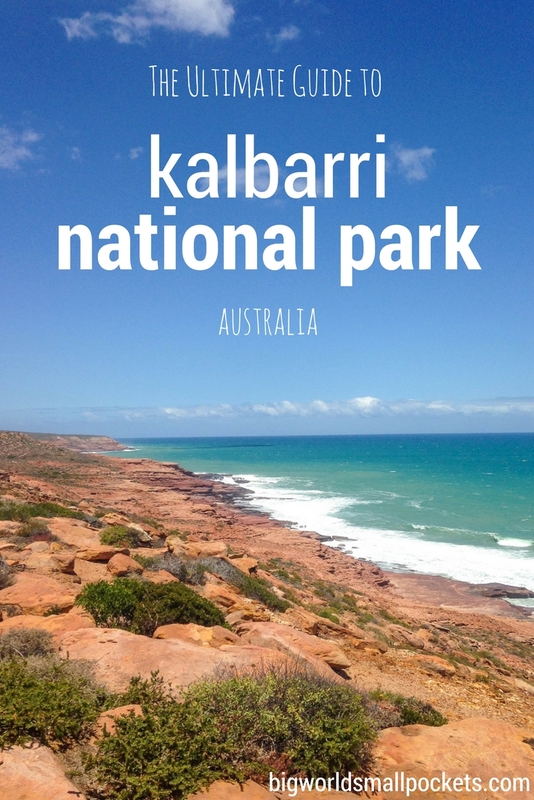 So Where Exactly is Kalbarri National Park? 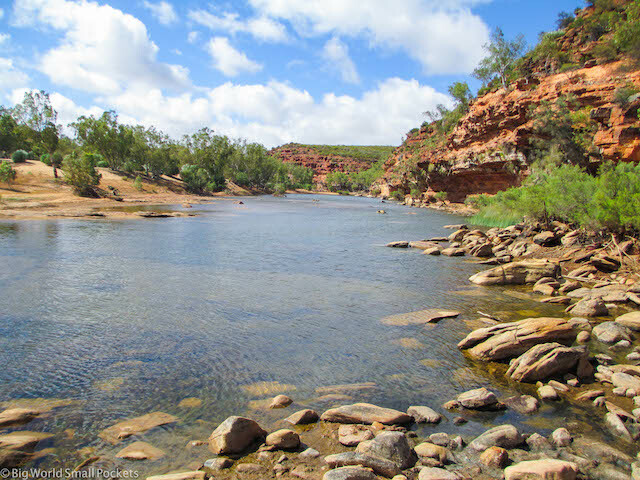 Just shy of 600km north of Perth, Kalbarri National Park sits where the Murchison River meets the Indian Ocean. It can be accessed from the North West Coastal Highway, which the main point transport route for Western Australia’s Coral Coast, which stretches from Exmouth in the north to the Turquoise Coast in the south. The town of Kalbarri itself is a small place that sits between the 2 main sections of the park. Most people visiting the park will base themselves here, as it’s just a short drive from the park entrance and there is a good stock of supplies and accommodation. Around a 6-7 hour drive north from Perth, Kalbarri isn’t somewhere you pop on a day trip from the state capital! No it’s far more likely that Kalbarri will form part of a longer journey you’re undertaking up or down the Coral Coast. 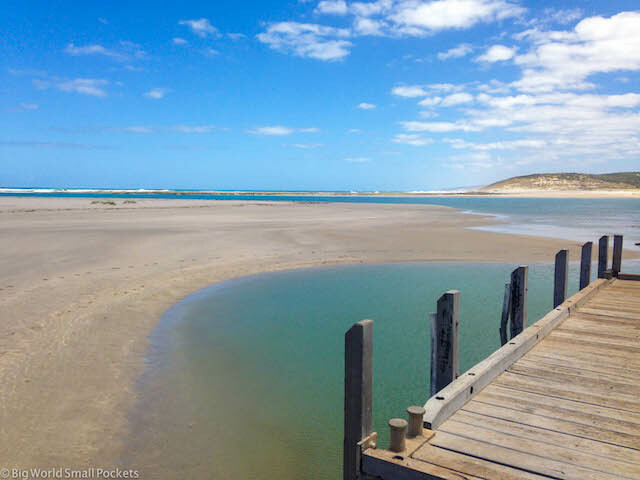 If you don’t have access to a vehicle, then you can also catch the Transwa Coach Service to the town of Kalbarri, which departs from Perth 3 times a week. 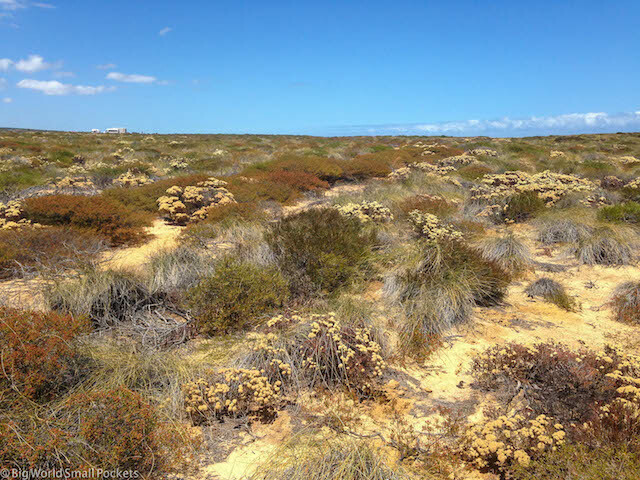 Kalbarri’s climate is generally described as similar to that of the Mediterranean, which means it isn’t unbearable at any time of the year. That said, most visitors will come here during the summer and autumn months of December to May, when warm days and nights make exploring the outdoors here a pleasure. 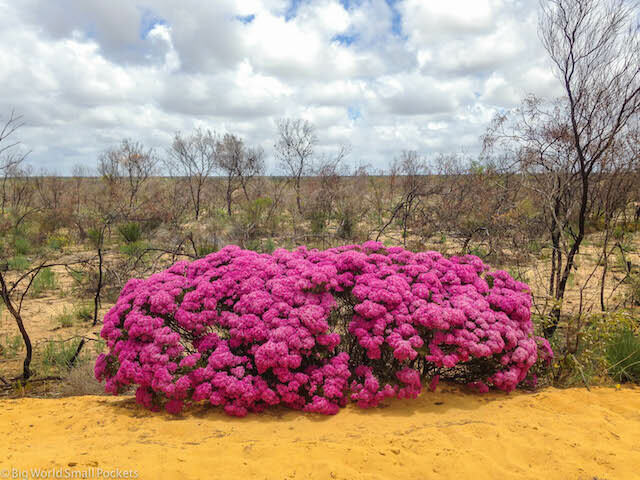 However, if you want to see the annual humpback whale migration, as well as the famous wildflower season, the autumn months of September to October are probably the best time to visit Kalbarri National Park. This is when we visited actually and, with less travellers around and mild temperatures, it was perfect. Like almost all the national parks in Western Australia, Kalbarri National Park has an entrance fee. Costing $12 per vehicle, this isn’t bad if there’s a few of you. That said, if you do think you’ll be visiting a lot of national parks in Western Australia, you might want to consider buying a Park Pass like we did. These offer great value for money if you’re travelling and exploring the state for an extended period of time. First up, it’s really important to know there is no camping within Kalbarri National Park itself. 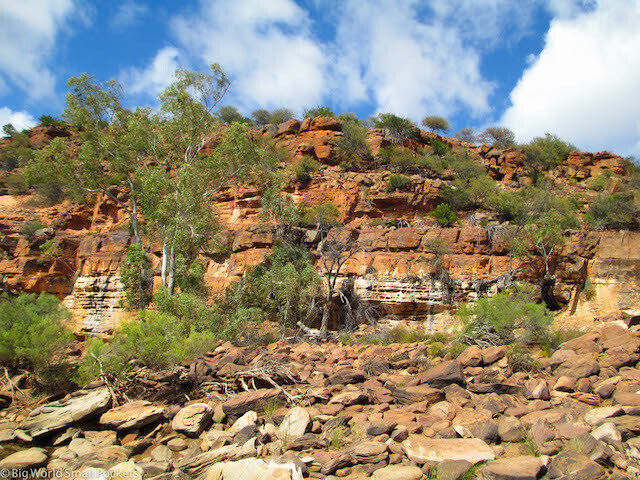 There also isn’t any free camping around, meaning you’ll almost certainly going to base yourself in the town of Kalbarri when it comes to accommodation. With tourism as its main industry, Kalbarri offers several good accommodation choices for a range of budgets. Most popular are the caravan parks, which fill up quickly, especially in school holidays and during peak season, so I would advise booking in advance. Our pick of the bunch was Murchison Caravan Park, where we spent a lovely 2 nights. Otherwise, the Kalbarri Palm Resort gets great reviews and looked lovely. 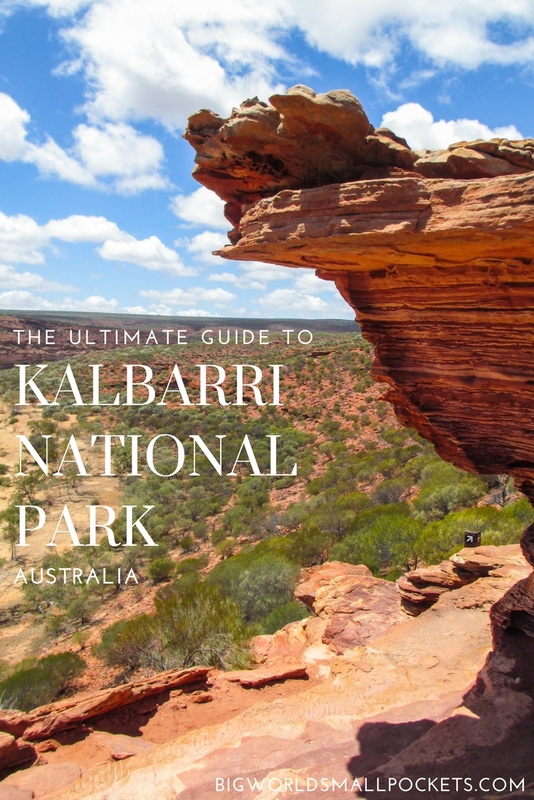 Bearing in mind that Kalbarri National Park is quite easy to access and compact, I’d suggest 1 or 2 nights there would be perfect. We planned to spend 1 night here but liked the little town so much, we decided to extend … does that sound familiar?! 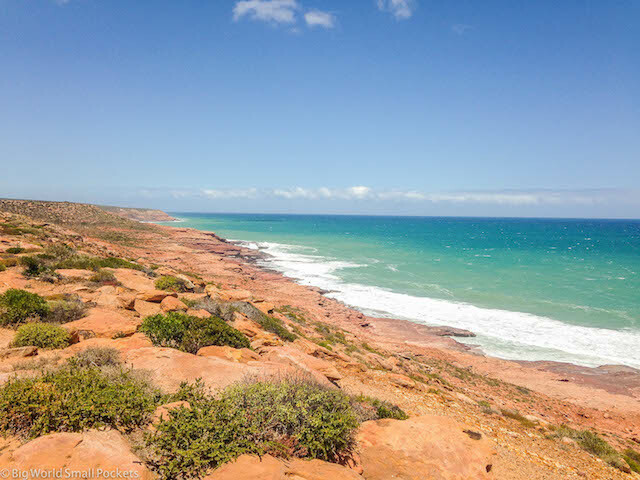 Along the coastal section of the Kalbarri National Park, which sits largely to the south of the town, the main attractions are the soaring cliffs, some great walking trails and lookouts. 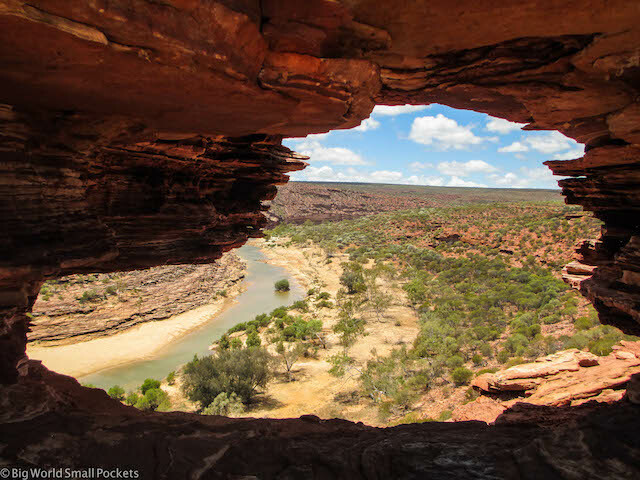 The inland section of Kalbarri National Park is the main attraction and where you should spend most of your time. That said, it can easily be covered in a single long day, including many of the smaller trails and all the good lookouts – the most famous of which, Nature’s Window, gives you a perfectly framed viewpoint down the length of the gorge. 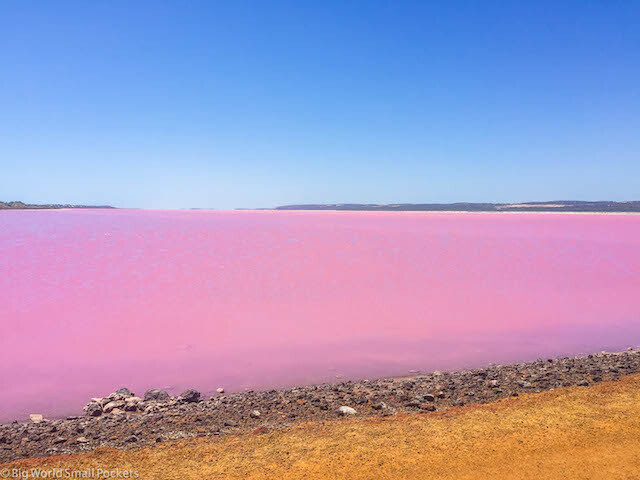 • Snap the Pink Lake at Port Gregory known as Hutt Lagoon only 55km from Kalbarri. This is sure to be a huge Instagram hit as the bubblegum colour really is hard to believe! • Surf the left hand break at Jacques Point which is one of only 2 registered National Surfing Reserves in Western Australia and definitely one for the more experienced. • Check out the historic buildings at nearby Northampton, one of the oldest settlements in WA, by picking up a brochure at the Visitor Centre and exploring structures that date as far back as 1885. I definitely recommend putting this one on your list if you’re heading up or down the Coral Coast anytime soon! Can I know how to I travel around in Kalbarri if I am not driving ? I heard that there is no public transport available in Kalbarri ! Hi Kim, the sad news is that you are going to struggle in Kalbarri without your own transport. My best advice is to go to the town of Kalbarri and try and source a day tour from there in a coach. You will need a vehicle (or someone’s vehicle!) to see this amazing park! Great post here. Those pictures that you posted, the rock with a hole in the middle, the pink lake, they are all accessible with a campervan right?